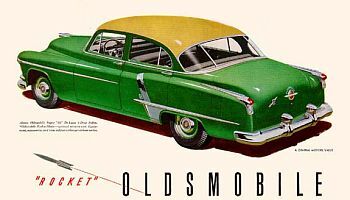 Oldsmobile jest trzecią marką General Motors oferującą wspomaganie kierownicy. 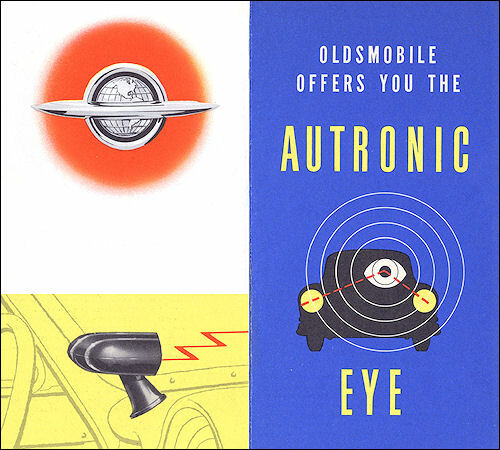 Here's another Oldsmobile first ... the Autronic Eye ... a new high in driving safety and driving convenience! 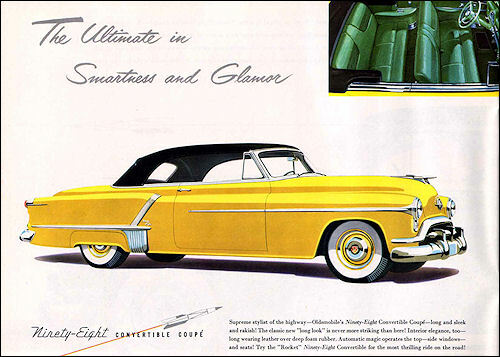 This remarkable new accessory, now offered to Oldsmobile owners, dims and brightens your headlights automatically. Mounted on the instrument panel at the left side of the windshield, the Autronic Eye is placed in automatic operation by pressing the headlight floor switch to bright position and leaving it there. When an oncoming vehicle approaches, the Autronic Eye picks up the beam of its headlights and automatically dims your own at a safe distance from the other driver. As soon as the vehicle has passed, the Autronic Eye switches your headlights back to bright, unless, of course, another oncoming motorist is within its range of operation. You can override the Autronic Eye, when necessary, and keep it from dimming your headlights, by holding down a special floor switch with your foot. To shut off the Autronic Eye completely, you simply press the regular floor switch back to dim position. 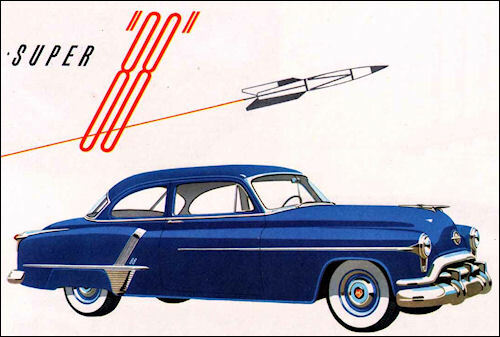 Here's the finest steering system in any American car – GM Hydraulic! This great new feature lets you take hair-pin curves or sharp city corners ... ettortlessly. And it allows you to park in the smallest space, with finger-tip ease. GM Hydraulic Steering is a major safety feature, too, as it takes out the steering effort but leaves in the "feel" of the wheel. You enjoy a new driving ease, but you're in command all the way. 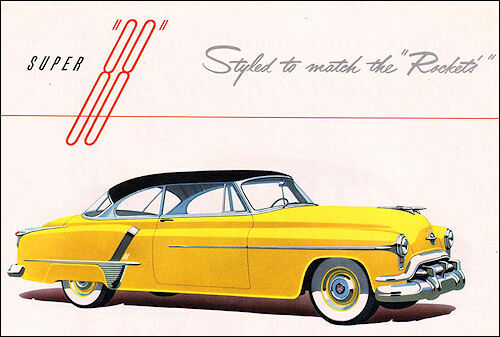 Two brand new Oldsmobile De Luxe “88s” for 1952 - the 4-Door Sedan and the 2-Door Sedan! 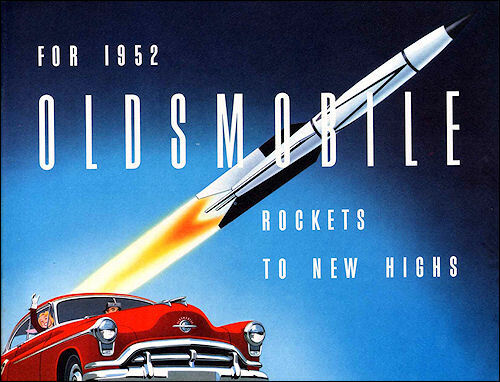 Each one is a budget -priced beauty – distinctively Oldsmobile in every respect!Each one is powered by Oldsmobile's famous "Rocket Engine! Each offers new Oldsmobile Hydra-Matic Super Drive and new GM Hydraulic Steering as optional equipment at resonable cost! 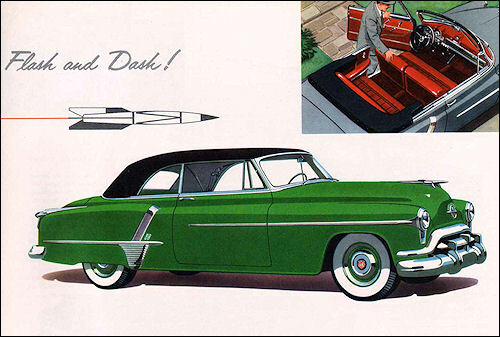 Plus many more up-to-the-minute Oldsmobile features! 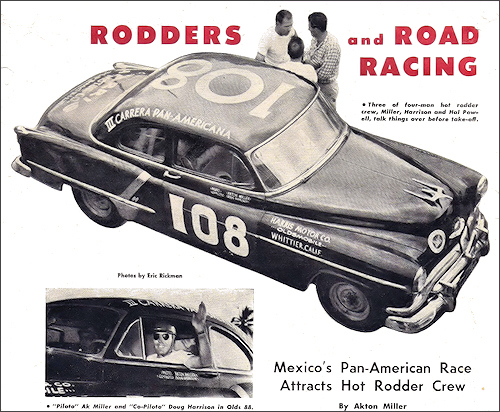 These are the lowest-priced Oldsmobiles, the lowest-priced "Rocket" Engine cars! Without a doubt, the new De Luxe "88s" are outstanding value stars – the best buys in their field! “Rocket” V8 cyl., 303 cu.im., 145 h.p. 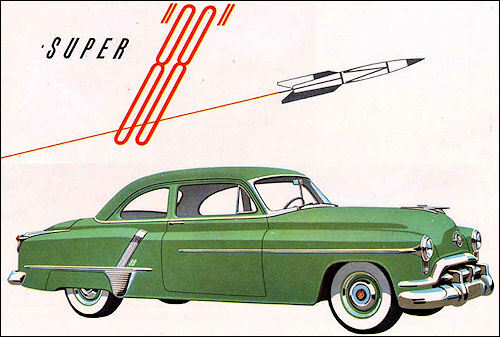 Celebrated star among the "Rocket" cars – the ever-popular Super "88" 4-Door Sedan! Stand-out styling in any setting! Matchless action on any road with Oldsmobile's mighty new 160 h.p. ''Rocket' Engine! 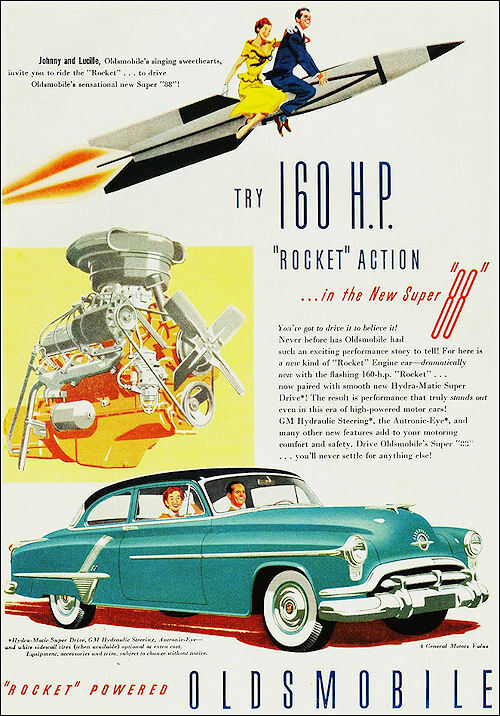 Plus Oldsmobile's new Hydra-Matic Super Drive – revolationary new General Motors Hydraulic Steering – and many, many more advanced new features! “Rocket” V8 cyl., 303 cu.im., 160 h.p. "Classic" . . . the ultimate in modern design! "Classic" . 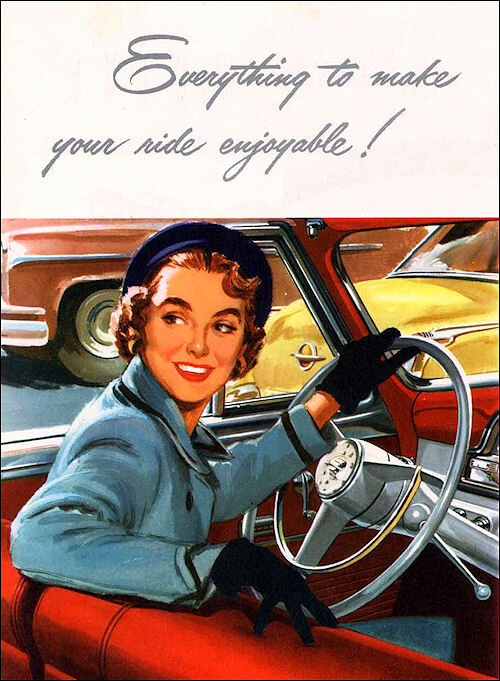 . . it's Oldsmbile's dramatic new 'long look" in motor cars! Here is supreme new beauty – long, low sweeping lines that spell out "Classic" in every detail. And in action, the Ninety-Eight is classic, too, with the revolutionary 160 h.p. "Rocket" Engine! 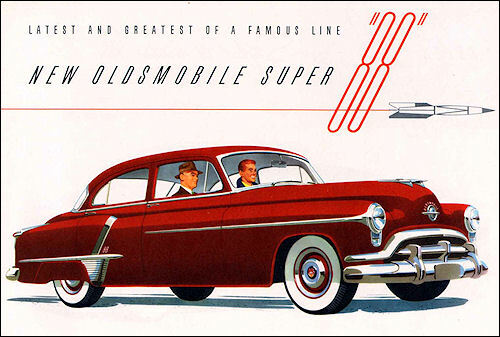 Brilliant new Oldsmobile Hydra-Matic Super Drive! Effortless new GM Hydraulic Steering! Custom-Lounge Interiors – the last word in luxury! The new 124" wheelbase provides a ride that's nothing short of sheer velvet! Plus a galaxy of other outstanding new features! 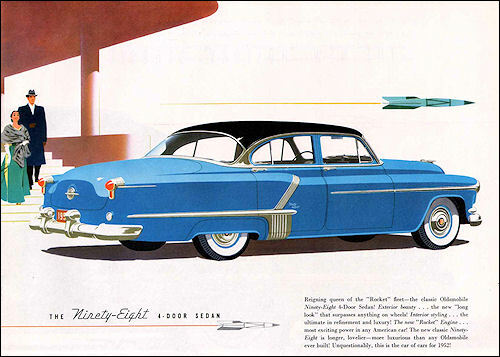 All in all, this is Oldsmobile's ultimate achievement in 55 year, of motor-car manufacture.